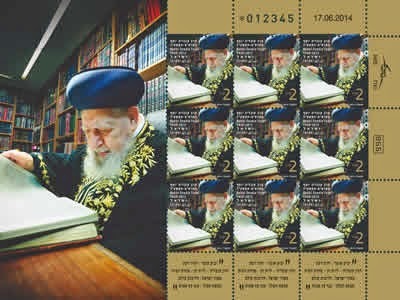 The Israel Philatelic Service, Israel Postal Company is issuing a stamp to mark one year since the passing of Maran Rabbi Ovadia Yosef. Maran Rabbi Ovadia Yosef (1920-2013) was known for his talent, diligence and love of Torah study from a very young age. He began his Torah writings at age 9 and published his first literary work when he was 17. Rabbi Ovadia Yosef was ordained as a rabbi at age 20 and became the youngest rabbinical judge in Israel. He served as the Head of the Rabbinical Court and as the Deputy Chief Rabbi of Egypt, as a rabbinical judge in the Rabbinical Court in Petach Tikva and later as a rabbinical judge in the Rabbinical Court in Jerusalem, as well as a member of the High Rabbinical Court. He served as the Chief Rabbi of Tel-Aviv-Jaffa and in 1972 was selected to serve as the Chief Rabbi of Israel, the "Rishon Le'Zion". During his years as Chief Rabbi, he made important decisions regarding social issues and issues of Jewish law that resonated on a national level and bore historic significance, such as his bold ruling confirming that the Ethiopian Jews were in fact Jewish, thus allowing them to immigrate to Israel; allowing marriage with Karaite Jews, subject to the terms of Jewish law; and "releasing" all the wives of IDF soldiers who remained missing after the Yom Kippur War so that they were able to remarry. Rabbi Ovadia Yosef founded the Shas political party and served as its spiritual leader and president of the Mo'etzet Chachmei HaTorah (Council of Torah Sages). Prime ministers and presidents came to his home, seeking his rulings and advice on a wide range of political and security issues. Over the years, he caused a social revolution, improved the position of Oriental Jewry and served as a guide for thousands and tens of thousands. world, in which he related to actual questions arising from modern technology. He was awarded the Israel Prize for Torah literature for his books. He was mourned greatly throughout the Jewish world in Israel and the Diaspora when he passed away. His funeral, attended by nearly one million mourners, was the largest in the history of the State of Israel. His tombstone is worded simply and humbly, expressing the nature and character of the man who was admired by the masses but remained humble. Rabbi Ovadia Yosef shall be remembered in the history of Israel as the greatest in his generation and as an incredible genius who gained the title of Maran (Master) and was considered to be the "adjudicator of a generation". He was a dedicated and esteemed leader who dedicated his life to the people of Israel and prayed throughout his life for the redemption of the general public and of its individuals. His spirit shall glow in the pages of history as one who left an indelible mark on the State and on society. His character, legacy and leadership accompany the scores of students and admirers who continue to bask in his light.